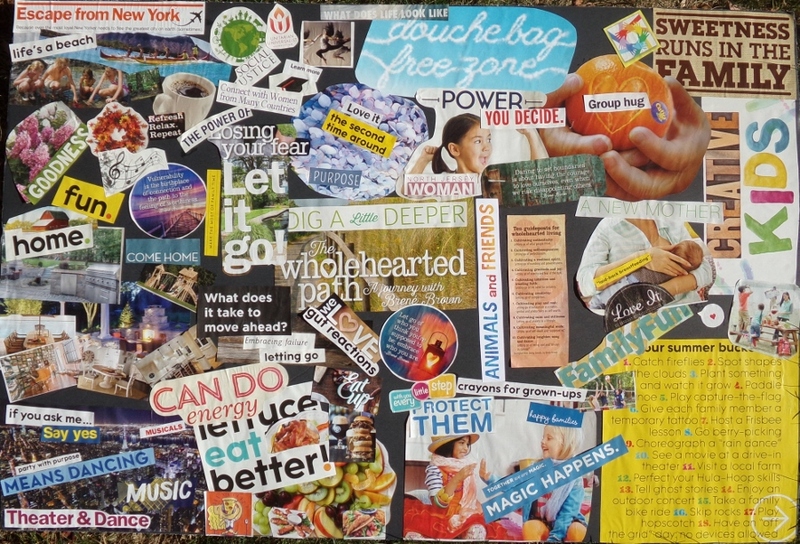 My Vision Board – My Voice. My Vision. Character: If you could be anyone what type of person would that be? A social butterfly? More humble? Ballsy? Truly authentic. Willing and able to stand up for what I believe without shutting down or taking out other people. Kind. Gentle. A good listener. An active listener. Trusted. Someone others come to when they are hurting. Fun. Able to embrace silliness and not worry about what is expected of me. Compassionate. Passionate. Determined to advocate for causes I care for until the world no longer needs to correct the problem. Health and Body Image: What is your healthy ideal? Do you want to be someone who can eat indulgent foods and not gain a pound? Do you want to be able to run a marathon or swim the English Channel? Do you want to wear a bikini without fear? Would you like to have the curves of Rosemary Clooney or Elizabeth Taylor? I’d like to be able to go back to a dance class and not feel out of place physically. I am out of shape now and would like to be more physically active. I am not currently happy with my body. I am mushier than I have maybe ever been. Though I know I don’t look bad, I don’t feel good about myself. I don’t feel physically strong. I’d like to tone up again. I’d like to enjoy eating well. Though I am a much healthier eater than I once was, I would still rather eat nachos than just about anything. I wish I could WANT to eat healthy foods, not do it out of obligation. I’d like to not let my joints get any worse than they already are. Home: What is your dream home? Is it a loft in Los Angeles? Do you see yourself roaming a ranch in Wyoming? Or a beach cottage in the Carolinas? My dream home is here in New Jersey, outside of Boston, or outside of Washington DC. No matter where, my dream is to own an updated center hall colonial. 4 bedrooms and two full baths with a powder room downstairs. It will have a sun room with comfortable seating and at least one, but maybe two fireplaces. The dining room has a big bay window in it, wide double crown molding and a chair rail. There is a large living room on the main floor, big enough to have a grand piano in, and a nice sized family room downstairs so the kids can have friends over. The kitchen has light, probably almond colored cabinets, with lots of counter space for holiday baking and an island that the kids can do their homework at while I make dinner. There is a breakfast nook off the kitchen, big enough to seat six at a booth like table. There is a small front porch, big enough to hang a swing on. The yard is open and level. Lots of hydrangeas and lilacs line the property and maybe a cherry tree. There is a detached garage, far enough away from the house that we can mount a basketball hoop and play ball in the drive. A big swing set in the back and room to set up a volleyball net during gatherings. We’ll have a natural stone patio with a big grill, ideally an outdoor kitchen, and a large table with comfortable seating to spend time at after meals. We’ll have a fire pit with big, comfy sectionals for lounging, napping, and reading. Tangibles: What material things are in your life? A KitchenAid stand mixer? A riding lawn mower? Manolos for every occasion? See above. I feel good in new clothes, and though I would never want to spend a lot of money on clothes, it would be nice to be able to invest a couple of hundred dollars a season on something nice and trendy. I’d like for Georg to have a Steinway at home. Is a horse tangible? I’ve always wanted to have my own horse and now that my son is getting into riding that dream is at the forefront. Relationships: Who do you share your life with? A spouse? Religious community? A small circle of close friends or a large weekend crowd? Do you talk to your sister every day? Are you in touch with your parents? Georg and I will always be together. Hopefully my parents are able to move closer and my sister’s family so that my family can get together more often. I’d like to be closer with my older sister. We used to be best friends and my first marriage left our relationship strained. I would like to maintain the friends that I currently have and see those friendships grow deeper. I’d like to have a broader base of friends my age with kids. I am optimistic that I WILL prevail in family court and that Aidan will get to be with us full-time. There will come a time when Rolf is no longer a part of my life. Personal pursuits: Where do you want to travel? Have you always dreamed of taking a ballet class? Do you want to paint on the hillside? Are you learning new languages? I’d really like to go back to dance class. I want to learn German so we can speak it at home. I would like to take a creative writing class, maybe a web design course. I WILL finish my undergrad and do think I will get a masters degree, but I’m not uber dedicated to that as a goal right now. Work: What profession do you dream of? Is there a company you would love to work for? Is there a promotion that excites you? If I could put together a dream job it would be curating theatrical works that empower and tell the stories of women. If I could work close to home and fairly normal hours I’d love to work in a theatrical environment again. If I stayed in nonprofit I’d like to be with a bigger organization with a lively staff and grassroots base to interact with. I have this idea of wanting a collaborative workspace with white board walls. Community: What type of world do you live in? Would you rather your neighbors leave you alone or be in a neighborhood where street parties are common? What does society look like? I’d like to be in a diverse community that feels small town but has easy access to all city life has to offer. I’d like to live in a neighborhood with kids the same age as ours so they can run around and play together. Now think about your purpose. Have you been put here to fulfill a unique purpose? Do you have a destiny to fulfill? Write a reflection about your purpose. This could be really tricky for some. For others it may seem far out of reach but you may have an idea. I am here to make sure that other women who have suffered know that they are not alone. I am here to raise a son who is a feminist, can see the world without judgement or hate, and to know how to embrace joy. Ready to do your own? Head over to Your Vision and get started!